Rainbow chard has been the most surprising thing I've grown this summer. I've cut it down and frozen a good portion to use in soups and stews this winter and it just keeps growing back with a greater yield each time. I basically have chard coming out of my ears. As a result, I've been scouring my cookbooks looking for new ways to feature greens in simple dishes that I can have for a quick, healthy lunch. This recipe for baked eggs came from Plenty by Yotam Ottolenghi and it has changed everything. About lunch, that is. Most days, lunch consists of odds and ends from the refrigerator. That's not always terrible, but sitting down to a proper meal like this one is infinitely more fulfilling. Taking a few quite minutes to enjoy delicious, nourishing food is something I take for granted and really shouldn't. This meal reminded me of that, with it's comforting flavors and luxurious textures. One of the greatest parts about this meal is how easy it is. The greens (I used rainbow chard but you can use anything- Ottolenghi calls for arugula) are simply sauteed in olive oil, then the eggs are tucked into the greens and baked until just set. The magic really happens with the addition of garlicky yogurt and melted butter infused with chili flakes and paprika. It is truly a perfectly balanced, delicious meal. Heat the oil in a large pan over medium heat. Add the chard and saute until wilted and most of the liquid evaporates. 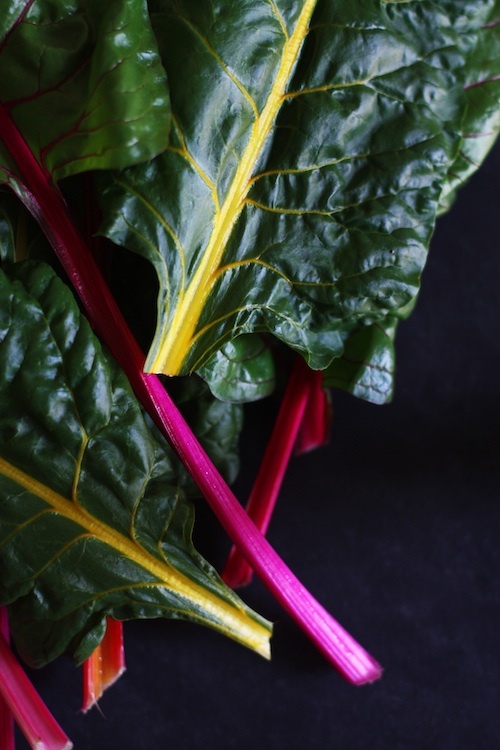 Transfer the chard to an ovenproof dish or skillet and make 4 holes for the eggs. Break an egg into each hole. Bake for about 15 minutes or until the whites are set. Watch them carefully because the eggs will go from not done to over done very quickly. Meanwhile, combine the yogurt, garlic and some salt. Set aside. Melt the butter in a small saucepan and add the red pepper flakes and smoked paprika. Cook until the butter is infused with a nice red color and just begins to foam. Add a pinch of salt and the sage. Remove from the heat. Remove the eggs from the oven and top with a dollop of yogurt and drizzle with butter.